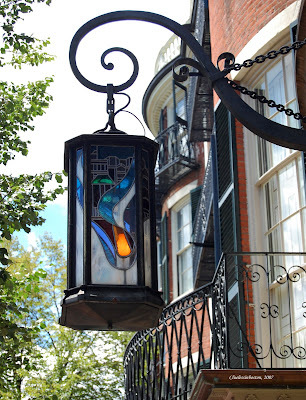 Lantern is located on Beacon Street, and hangs from a private residence down the street from the State House. One can see so many lantern styles in Boston. You've photographed some lovely ones, C*. (*) I just can't bring myself to call you "clueless". I hope you won't mind if I address you as "C". what a beautiful lantern - I hope nobody steals it! Hi Fénix. That is a particularly beautiful lantern, but is so high on the building I doubt many people notice it. BTW, my real name is Jim. Also, I loved your Toronto pictures today.